southwest side of the park in front of the chapel were gone, with much of the sand washed into and around the building. Chad Lach, Park Manager III for Gasparilla Island State Park administration, didn’t even know where to begin at first when it came to the clean-up. The firefighters helped as best they could, pushing the water out of the building until it became manageable. The building, however, was still buried. Then came a man named Steve. Chad didn’t know what his last name was, but whoever Steve was, he saw a plea on Facebook for the use of a Bobcat excavator. Mystery Man Steve dropped one off the next day, and the good job Irma did of covering the little chapel in sand was quickly reversed. Two of the park’s dune walkovers that had already been damaged in other storms became dangerous to walk under, as precariously-hanging twisted boards were raining down in a stiff breeze. Volunteers who live on the island and some who just love the island came to help as well, some with their own shovels. Boy Scout Troop 776 from Gulf Cove and Troop 26 from Englewood came and moved mountains of debris. Some came and scrubbed walls and windows and swept out the building. It soon became apparent how very blessed we were to have escaped this storm’s greatest wrath, and how our neighboring communities needed help. One of the first groups to respond were Howard and Emily Wise of Hudson’s Grocery. Days before the storm, when they realized the proximity of the coming storm to the island, they made plans to fill a semi-trailer truck full of necessary supplies and send it down from their primary residence in Alabama. The Wise family is one of the most generous on the island, but normally never tout their good deeds if they can help it. This time, though, Hudson’s was right in the thick of the action. 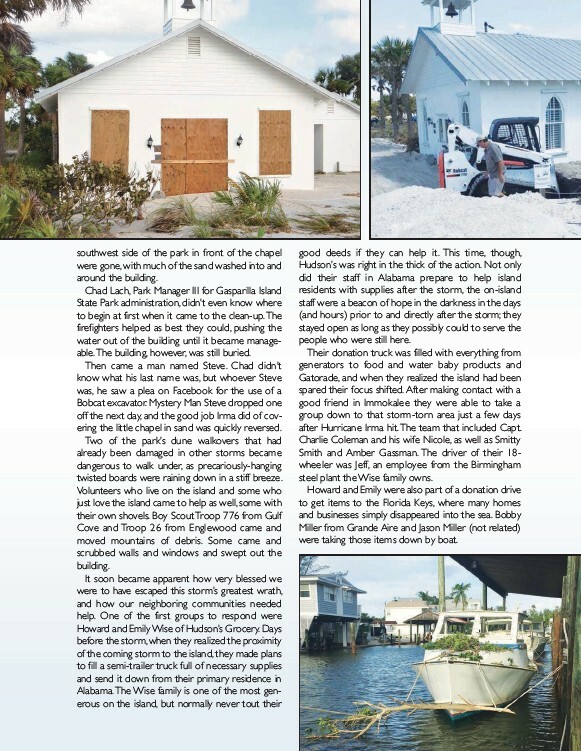 Not only did their staff in Alabama prepare to help island residents with supplies after the storm, the on-island staff were a beacon of hope in the darkness in the days (and hours) prior to and directly after the storm; they stayed open as long as they possibly could to serve the people who were still here. Their donation truck was filled with everything from generators to food and water baby products and Gatorade, and when they realized the island had been spared their focus shifted. After making contact with a good friend in Immokalee they were able to take a group down to that storm-torn area just a few days after Hurricane Irma hit. The team that included Capt. Charlie Coleman and his wife Nicole, as well as Smitty Smith and Amber Gassman. The driver of their 18- wheeler was Jeff, an employee from the Birmingham steel plant the Wise family owns. Howard and Emily were also part of a donation drive to get items to the Florida Keys, where many homes and businesses simply disappeared into the sea. Bobby Miller from Grande Aire and Jason Miller (not related) were taking those items down by boat.